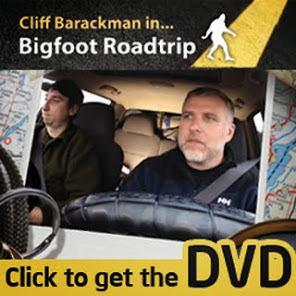 Cliff Barackman with Mt. Rainier in the background. This past weekend, I was invited on an expedition to an area outside of Mt. Rainier National Park. 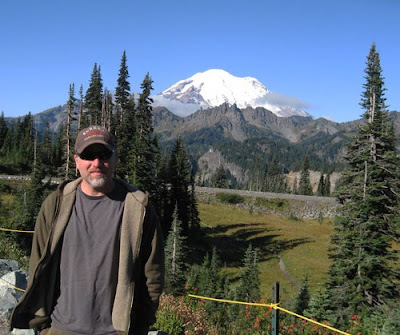 Bigfoot researcher and friend, Bart Cutino set aside the weekend to fly up and meet some close friends at the location of his sighting from August 2007. Besides Bart, in attendance were Paul Graves, Robert Leiterman, David Ellis, his wife Terry, Will Robinson, and me. Upon arrival at approximately 9 pm on Friday night, I was asked if I just did a scream. I had not done any vocalizations since I was driving, so the group excitedly told me that a possible vocalization had just moments before come from the direction of a nearby swamp. Paul Graves had also recorded a possible vocalization from that same direction the previous night when he was alone at the camp. I heard the recording and it sounded promising. 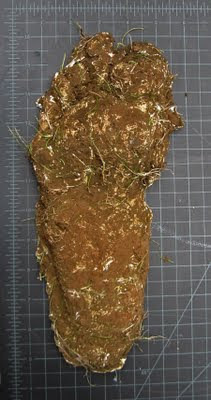 On Saturday morning, Dave Ellis and Robert Leiterman made a trip to a nearby lake to cast some footprints that were found on Friday afternoon. Dave correctly observed that there was a conspicuous ridge in the foot that made him wonder about the species of the print-maker. Several casts were made, but I suspect that they are of human origin. The toes, ball, arch, and size all point to homo sapien. Still, kudos to Dave for not only being prepared, but also for casting when in doubt. Always cast when in doubt! Casting material is cheap, and it's good practice for the real thing. That practice might come in handy someday. Two views of the same cast. Very likely of human origin. Besides that possible vocalization, and the one from the previous night, the trip was relatively quiet. Some sounds were heard, but I am not so sure they were sasquatches. A series of siren calls were heard, but several emergency vehicles were seen on the road the next day. The recording points to actual sirens as well. At one point a roaring sound was also heard, but soon thereafter, a semi truck and a smaller vehicle zipped up the road past camp. I'm inclined to think that we heard a trucksquatch from a good distance. Just because the trip was relatively quiet does not mean it was without excitement. We had a surprise visitor on Saturday evening. Bob Gimlin, who lives less than two hours away, heard we were in his neck of the woods and made a point of dropping in to visit with us for a few hours. Any time spent with Bob is time well-spent, as he is one of the best people on the planet as far as I can tell. He's kind beyond words, a true cowboy gentleman that is full of stories, history, and wit. We shared bigfoot stories, caught up on recent happenings, cracked some jokes, and shared some of my mother's excellent home-made cookies that I received in a care package last week. Mom, in case you're reading this, Bob said, "Cliff, your mom sure makes a good cookie!" He's right, she does. 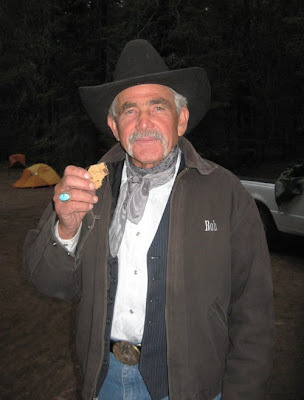 Bob Gimlin with a cookie from the master. There was a little negativity on the trip. There was a man and woman camping a few hundred yards up the road from us that had two golden retrievers. Normally, golden retrievers are great dogs, craving attention and being generally lovey. These were, well... jerks. They ran off-leash constantly, bounding out to the road to bark menacingly at passers-by. They threatened to bite any of us who passed, actually nipping at Will, but not breaking the skin. When approached, they would cower and shrink back before starting the whole barky thing again. And their owner wasn't much better. His bark was worse than his bite, too, thankfully. He threatened to shoot Will and I if we walked past his camp again. I've never been threatened with being shot before. I was a little unnerving. Will and I were doing a night walk on the road at about 11:30 when his idiot dogs came running out. Then the idiot owner came out with a flashlight and shouted, "What are you looking for!?" at us. I answered, "Mammals." I don't think he understood. "What?" he asked stupidly. Perhaps the multi-syllable word confused him. "Mammals," I replied. "Wanna see?" I started walking towards him with the thermal imager. He could plainly see me and the gear, but he grew agitated. Will added, "You can see heat signatures..."
"I'll show you a heat signature of my shotgun!" interrupted the bellowing moron. He repeated that same mantra (or something just like it) a few times, not comprehending that his fear of two harmless folks walking on public land at night made him seem like a frightened chihuahua barking at a stuffed animal. The worse thing about his threats of shooting us if we walked by his camp again was that we had deployed a team already and they were up the road about a half mile. They had to walk by this genius' camp to return to our own. That problem was solved by me driving to pick them up, which I was happy to do. Anyways, Mom, if you're still reading this, relax. I'm safe. That guy was just scared and that's the first time anything like that has ever happened to me in many, many, many years of camping in remote areas. I wasn't even alone. Still, I'm starting to reconsider Dad's offer of giving me his old firearm (he's a retired sheriff).